The City of Emporia City Council has approved a one year extension to allow the hauling of forest products through the City until December 31, 2016. Councilman Woodrow Harris asked the City Manager to place this issue on its December 1st Council meeting agenda. On December 1st, City Council members heard from members of the Virginia Loggers Association, local business leaders and the Virginia Forest Products Association requesting City Council allow forest products to be hauled through the City. City Council members voted unanimously to place the amendment item on its December 15, 2015 Council meeting agenda to change City Statute 74-13 and allow the hauling of forest products through December 31, 2016. City Council took up the matter at this December 15th meeting and unanimously voted to approve the amendment to their City Statute 74-13. VLA members and others attended the meeting. City Council members expressed their hope that VLA would be successful with federal legislation that would increase truck weights on the interstate highway system. All who spoke expressed support of forest products industry, but also spoke of their serious concern about the maintenance of their City streets. Below are the rules set forth when the first exemption in City Statute 74-13 was obtained in 2014. These rules and the route shown on the map below are very important. We ask those using the privilege of hauling forest products through the City of Emporia follow these rules and the route guidance below. No empty trucks through town on Route 301. This is very important to keep the amount of trucks in town to as small a number as we can. 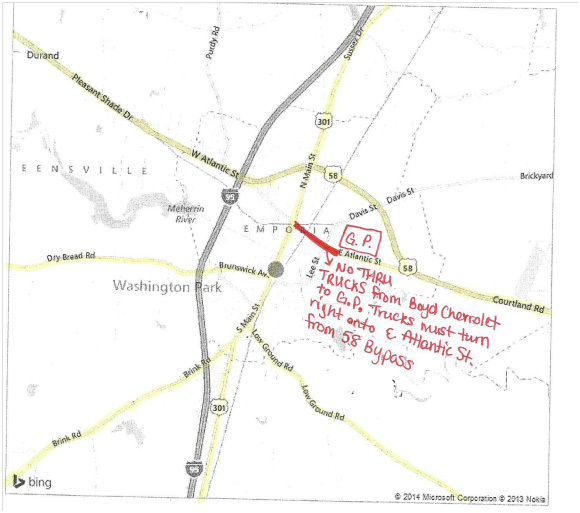 Loaded trucks should stay on Route 301 (North and South) through Emporia. You can use Route 301 to access the Low Ground, Brink, and Dry Bread Roads. Remember, we are supposed to be using 58 Bypass to get to Georgia Pacific’s Plywood Plant, not 58 Business. No trucks should be turning East on 58 Business (East Atlantic Street) at the intersection at Boyd Chevrolet. Trucks should turn onto East Atlantic Street from 58 Bypass. Please refer to the attached map for additional information. Do not convoy through town and do anything you can to avoid causing traffic delays. Be courteous to all motorists. This ordinance does not mean you have to use Route 301, it is just another option. If you decide I95 is in your best interest or you do not want to fight Emporia traffic, by all means, use the interstate. In conclusion, a tremendous amount of effort has gone into this ordinance and the extension. Those who haul forest products through the City of Emporia do so because City Council members provided an exemption for us from the prohibition on trucks through their City. Please make sure all of your drivers understand the routes and rules. If we fail to uphold our end of this agreement we will be back on the interstate without our weight exemptions. VLA Board members Frank Myers, CK Greene, Bernard Rose, William Snyder and others spoke to City Council on this issue and we owe them a great deal of gratitude. If you have any questions, please do not hesitate to call the Virginia Loggers Association at 804 677 -4290. Thanks in advance for your cooperation.